Did you know the original Breton had 21 stripes? Fact! How to wear those stripes at their best, well that’s the real question. Almost all of us own one (or two, or three…) because it’s perfect for any occasion. It’s our easy, go-to friend. It’s also not an item that’s going to go out of fashion, so you will be able to wear it year after year without feeling like it’s past its sell-by date. Here’s how to wear it for work, rest and play. During downtime, team your Breton with denim. It will create a chic, classic look, while also looking extremely casual and effortless. A loose-fit top is great styled with a pair of fitted or boyfriend jeans – go for a men’s oversized Breton to get weekend casual at its best. Head to Saint James to find yours or this one from J Crew will also work a treat. Teaming your Breton with cut-off denim shorts and Converses will give you an effortless off-duty casual look or wear an oversized one over your bikini. 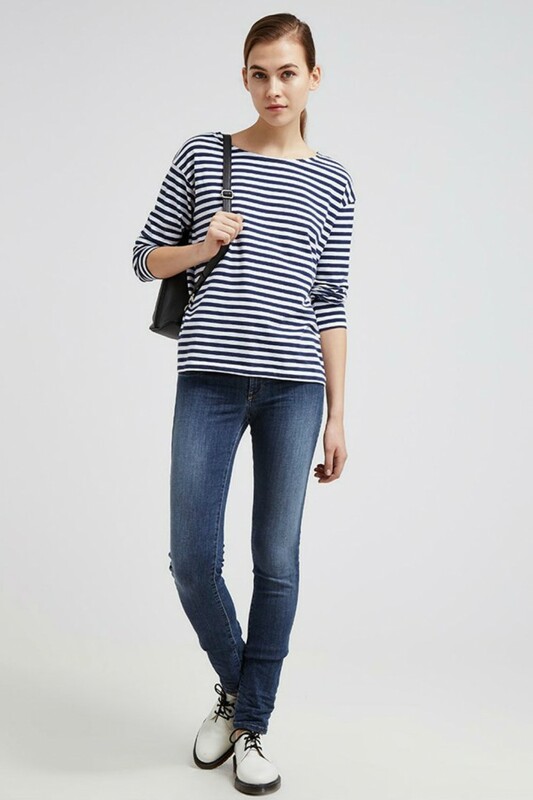 The Breton top is definitely office appropriate as it’s effortless and smart. This MIH one is the perfect classic Breton to add to your work wardrobe. The black and white stripe creates a professional feel. Wear it over a crisp-white collared shirt and team with a leather pencil skirt and heel, or you could even wear it underneath a tailored black suit to give it a little more personality. Otherwise team with a white trouser for a super-chic French look. A Breton top is not only for the day – take it to the evening. It can look super chic and stylish for the evening if you style it with the right item. Team with a midi skirt in a single colour or a clashing print and add a fun heel. If you want to go one step further wear your Breton with a long evening skirt to create a dramatic effect – not for those of us who are shy. This beautiful Breton is from Michael Lo Sordo and is perfect for adding va va voom! Adding jewellery is also a plus – it will instantly make your Breton more dressy and is the perfect way to take it from day to night.